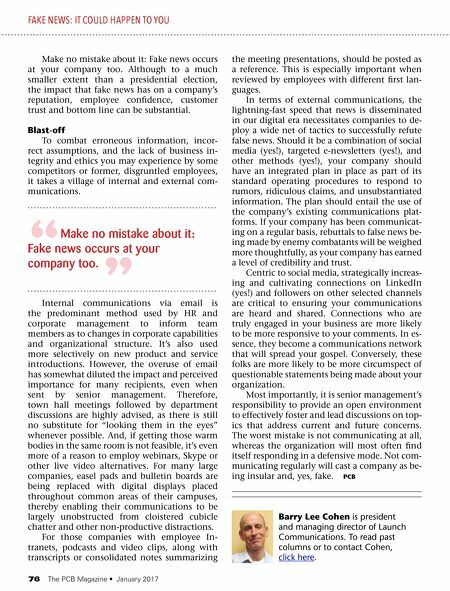 76 The PCB Magazine • January 2017 Make no mistake about it: Fake news occurs at your company too. Although to a much smaller extent than a presidential election, the impact that fake news has on a company's reputation, employee confidence, customer trust and bottom line can be substantial. Blast-off To combat erroneous information, incor- rect assumptions, and the lack of business in- tegrity and ethics you may experience by some competitors or former, disgruntled employees, it takes a village of internal and external com- munications. Internal communications via email is the predominant method used by HR and corporate management to inform team members as to changes in corporate capabilities and organizational structure. It's also used more selectively on new product and service introductions. However, the overuse of email has somewhat diluted the impact and perceived importance for many recipients, even when sent by senior management. Therefore, town hall meetings followed by department discussions are highly advised, as there is still no substitute for "looking them in the eyes" whenever possible. And, if getting those warm bodies in the same room is not feasible, it's even more of a reason to employ webinars, Skype or other live video alternatives. For many large companies, easel pads and bulletin boards are being replaced with digital displays placed throughout common areas of their campuses, thereby enabling their communications to be largely unobstructed from cloistered cubicle chatter and other non-productive distractions. For those companies with employee In- tranets, podcasts and video clips, along with transcripts or consolidated notes summarizing the meeting presentations, should be posted as a reference. This is especially important when reviewed by employees with different first lan- guages. In terms of external communications, the lightning-fast speed that news is disseminated in our digital era necessitates companies to de- ploy a wide net of tactics to successfully refute false news. Should it be a combination of social media (yes! ), targeted e-newsletters (yes! ), and other methods (yes! 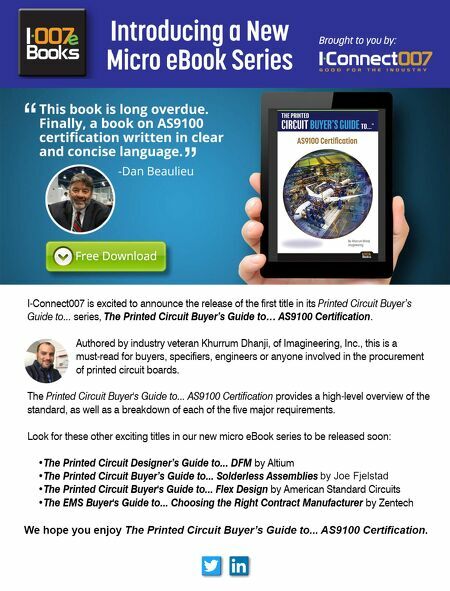 ), your company should have an integrated plan in place as part of its standard operating procedures to respond to rumors, ridiculous claims, and unsubstantiated information. The plan should entail the use of the company's existing communications plat- forms. If your company has been communicat- ing on a regular basis, rebuttals to false news be- ing made by enemy combatants will be weighed more thoughtfully, as your company has earned a level of credibility and trust. Centric to social media, strategically increas- ing and cultivating connections on LinkedIn (yes!) and followers on other selected channels are critical to ensuring your communications are heard and shared. Connections who are truly engaged in your business are more likely to be more responsive to your comments. In es- sence, they become a communications network that will spread your gospel. Conversely, these folks are more likely to be more circumspect of questionable statements being made about your organization. Most importantly, it is senior management's responsibility to provide an open environment to effectively foster and lead discussions on top- ics that address current and future concerns. The worst mistake is not communicating at all, whereas the organization will most often find itself responding in a defensive mode. Not com- municating regularly will cast a company as be- ing insular and, yes, fake. PCB Barry Lee Cohen is president and managing director of Launch Communications. To read past columns or to contact Cohen, click here. FAKE NEWS: IT COULD HAPPEN TO YOU " Make no mistake about it: Fake news occurs at your company too. " Feature Column — Final Surface Finish: How Do You Choose?